One of the basic laws of physics is that nothing can travel faster than light. Actually that isn’t quite true. Specifically, nothing can travel faster than light travels in a vacuum. 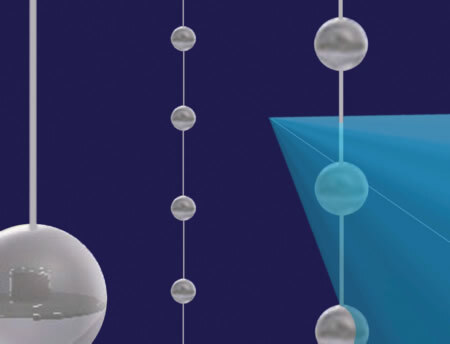 It is possible for things to break the light barrier when traveling through a material. The effect is known as Cherenkov radiation. While the speed of light in a vacuum is a universal constant, the speed of light in different materials can vary. For example, when light travels through water, its speed is about 75% that of light in a vacuum (speed in this case meaning phase velocity for you optics fans). It is this difference in speed that causes the refraction of light. If you’ve ever seen a straw in a glass of water appear to be “broken”, then you’ve seen refraction in action. The speed of light in a material also varies slightly by wavelength, which means different colors refract by slightly different amounts, leading to things like rainbows (but that’s a story for another time). Because light is slowed when moving through a material, it is possible for particles to “break the light barrier” in those materials. For example, in nuclear reactors, electrons are emitted with so much energy that they are travelling at nearly the speed of light (in a vacuum). When those electrons travel through the water surrounding the reactor they are traveling faster than light travels through water, thus breaking the light barrier. You’re probably familiar with the sonic boom that occurs when a plane breaks the sound barrier. Actually, the entire time a plane flies faster than the speed of sound, it is followed by a sonic boom. What happens is the plane is moving so fast that the sound pressure makes a cone of pressure (shock wave) that trails the plane. The cone expands at the speed of sound, which we hear as a boom when it reaches us. A similar effect occurs when an electron breaks the light barrier in water (or other materials). The electron causes an optical shock wave, and the result is a kind of sonic rainboom, known as Cherenkov radiation. Most of the light emitted by the shock wave is ultraviolet, but it also emits blue and violet light, so Cherenkov radiation is typically a brilliant blue light. A few days ago I talked about the IceCube neutrino observatory, and noted that they don’t detect neutrinos directly, but instead detect flashes of light that occur when a neutrino strikes a water molecule. What I didn’t say is that the flash of light is due to Cherenkov radiation. The interstellar neutrinos have so much energy that when they strike an oxygen nucleus a muon (one of the electron’s heavier cousins) is emitted with a speed faster than light in water or ice. The muon creates Cherenkov radiation which can be observed by the photodetectors, as seen in the figure above. Since the Cherenkov radiation is a directional cone, by timing the arrival of the flash at different detectors in the array we can determine not only the energy of the neutrino, but the direction of its origin. This is how we can determine that they really are from interstellar space, and not due to something like cosmic rays hitting the atmosphere.